Data center operators can take advantage of the flexibility of Software-Defined Networking (SDN) under an Open-Flow enabled control plane. 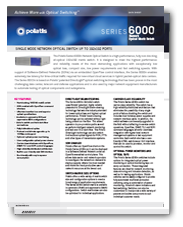 The ability to dynamically reconfigure Polatis switches via a standards-based SDN interface enables the optical switches to coexist with packet switches under centralized management control for efficiently orchestrating topology changes. 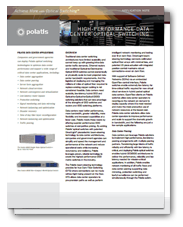 OpenFlow clients on Polatis switches allow data center colocation network operators to securely reconfigure the network on demand to deploy capacity where it is most needed and make the most productive use of network resources at the lowest cost.